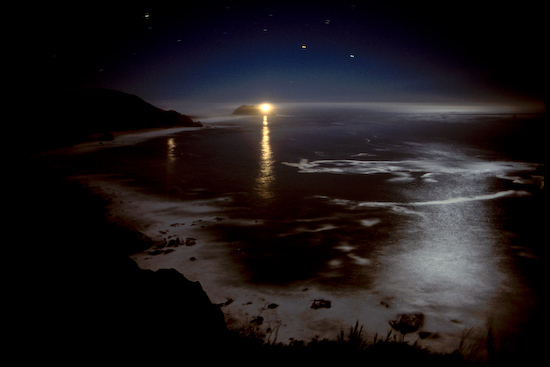 I took this night shot facing on the California coast near Big Sur. I believe I made a 30 second exposure, but I can't remember. You can tell how long the exposure is by the arc of the star trails. Every 1/4 degree (15 minutes of arc) is 1 minute. (I remember this by remembering that 360 degrees is a whole day, so 15 degrees per hour.) I'm too lazy to measure the angle right now so I'lll just guess it was 30 seconds. The bright yellow light is a lighthouse.